The question writer just tapped on at the local train station, to catch the train to the city. 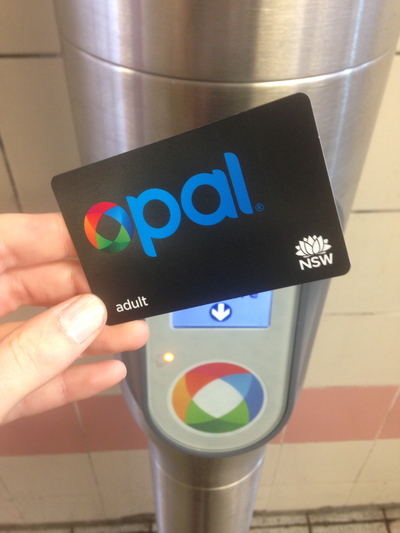 The new Opal card has been completely rolled out throughout the entire Sydney Trains and Ferries network. The rationale is to make eight paid trips a week, and after that all of your trips are free until the cycle begins again the next week. There are other perks to owning an Opal card, and with anything new, there could be a few teething problems too. If you're currently using an Opal card to get around on public transport in Sydney; do you like using it and why/why not? If you're not using an Opal card as of yet, will you get one? Why/why not? 2. Automatic top up of $40 when balance falls to $10. Can't believe my balance is $52 plus already...no fuss. 3. 30% discount for off peak travel. 4. Free travel anywhere in Sydney after eight paid trips (including off peak trains) in a week - already $10 cheaper than a weekly ticket for me. 6. Only pay one fare if you tap off and then on within a 60-minute period. For example a trip from Rhodes to Narwee is the same fare as Narwee to the city. Love it! The only drawback is memory - remembering to tap on and off. Used to that already. I haven't used one, and I'm not sure whether I could make use of it. I use public transport quite rarely. So is the card something I'd have to invest in regardless, or can I buy my single/return tickets as I used to, whenever needed? I haven't used it yet, and where I live I tend to take the bus more than the train. But if I ever move somewhere that has better train options I would absolutely use it. I used a similar system when I visited London a few years ago, and it made it so easy as a tourist (and local friends told me they loved it too). Absolutely! I got it as soon as I could. Lining up to buy a ticket is the worst when you work the same hours as everyone else in the city! I love how after peak hours, your ticket is cheaper as well, you don't get that with a normal Weekly, and after you've gone 8 trips in the week, the rest are free! Can't wait until it's rolled out on all the buses so I don't have to keep nipping in for a new Travel Ten and being told they're sold out. I now pay an extra $1.60 each day travelling to work by ferry. The free travel after 8 trips doesn't apply to me as I only need to travel 4 days a week. To top it off, I forgot to tap on this morning and paid the full default fare of $7.00 on an otherwise $5.60 trip. I'm not happy how this was marketed and communicated to the public. I made several enquiries re: whether I'd pay more and was told each time, it would be cheaper for me. They don't seem to get the 4 day a week travel thing. If I'd known it would cost me more, I would've stocked up on the old, cheaper travel ten tickets, which are no longer available. In fact there are no paper ticket alternatives now (e.g. qtly, yearly), only (v. expensive) single tickets.